More than 3,000 children’s books have found a new home on the shelves of the Francis Lettsome Primary School Library. The wide assortment of books was purchased last year by Harneys as part of its ongoing commitment to support literacy at the school. 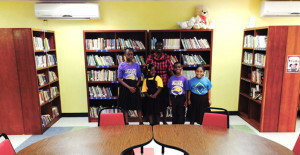 Over the summer, Harneys staff members Shonda Leacock and Thomas Borkowski led the firm’s effort to catalogue and organise the books so returning students of the Francis Lettsome Primary School in Long Look would have use of the more than 3,000 additional books by the time the school year opened. Harneys purchased the books last year from the Friends of the Sevier County Library System in Tennessee, USA. Other members of Harneys staff including Felice Swapp, Jahlil Mendes and Annet Frett together with Chantae Walters and Alyxa Kendall of the Elmore Stoutt High School gave a much needed helping hand to bring the library project to completion. “I am happy to see Harneys, as the school’s main sponsor, continually take such an active interest in FLPS. Harneys has provided much needed resources for the students and we hope that they will continue to partner with us to help students reach their maximum potential.” remarked Principal Deborah James. “The students will undoubtedly enjoy the expanded selection of books which will help to further improve their reading and comprehension abilities”. The additional library resource is aptly timed. The Harneys-FLPS fourth annual Winners Read & Reader’s Win competition commenced on Wednesday, 10 September, and the new books are expected to help FLPS students break their past year’s record of 893 books read over a five week period. Shonda Leacock, who kicked off the reading contest on behalf of Harneys last week, said: “This is a great time for the FLPS students. They are excited about the reading contest and I can see the additional books being put to use right away”. This is not the first time that Harneys has helped expand FLPS’s school library. The firm donated some 500 books in 2009. Harneys began sponsoring Francis Lettsome Primary School in 2004 and has over the past 10 years partnered with the Ministry of Education to open a computer lab, has made improvements to the school facilities and playground equipment, sponsored enrichment activities, and volunteered at school events. Supporting education and youth programmes is at the heart of Harneys’ CSR activities. The firm believes that investing in young people is the cornerstone of building a strong future for the British Virgin Islands.